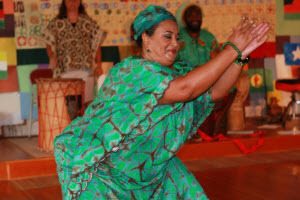 The Garden Home Community Library invites you to explore, learn and play with dances and rhythms from Ghana, Senegal and Cuba. The class will be led by Habiba Addo, a storyteller, dancer and teacher. The class is happening at the Garden Home Library on Tuesday, June 19th from 7:00 pm to 8:30 pm. All levels are welcome, and the library asks you to please RSVP for the event. Habiba was one of the storytellers at this year's Hearing Voices Storytelling Festival. Her warm sense of humor and respect for these revered dance traditions guarantee an enjoyable and uplifting experience for all students. Summer Reading 2012 starts today!